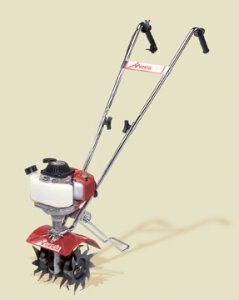 Mantis 4-Cycle Tiller All the features and benefits of the 2-Cycle Mantis Tiller/Cultivator, now with a 4-Cycle Honda engine! It's easy to start, requires no fuel mixing, and weighs only 24 pounds. Features: Lightweight, but powerful enough to till through sod and compacted soil. Turns soil into a fine texture, ready for planting, At 24 pounds it's easy to carry - to the shed, to the car, or to your neighbor who can't wait to try it, Great for senior gardeners, Quiet, smooth-running, 4-Cycle commercial grade engine, No fuel mixing, Easy to start, Fold-down handlebars now make it even easier to transport in your vehicle or store in your shed, Tills 10" Deep, 9" Wide, Commercial-grade 4-cycle engine, Reliable and easy to start. Note: Tiller Shown with optional Kickstand not included but we also have available.